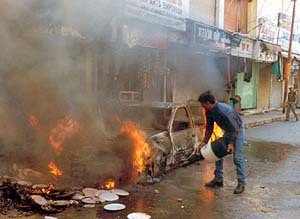 A man tries to extinguish a fire caused by a grenade explosion near Raghunath Temple. 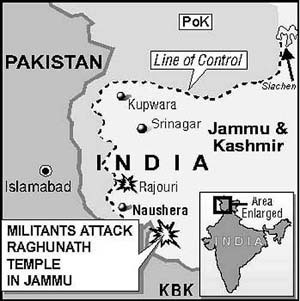 Four civilians were among nine persons killed and 19 injured when two heavily armed militants, believed to be foreign mercenaries, stormed Raghunath Temple in the heart of the city today firing indiscriminately and exploding a grenade. The security forces deployed in the area retaliated resulting in the heavy exchange of fire that left both militants killed, Jammu’s Divisional Commissioner Anil Goswami and IGP P.L Gupta told reporters. Giving details of the attack that occurred at 10.20 a.m. Mr Goswami and Mr Gupta said the militants opened indiscriminate fire after alighting from a vehicle at the security personnel outside the temple killing the guards and a policeman on the spot. They then barged into the temple complex exploding a grenade and firing on the worshippers killing four of them and injuring many. Earlier, official sources had put the toll at 10 including four security personnel. Narrating the sequence of events during the attack, a senior official said the ultras gunned down two Special Services Bureau (SSB) personnel who were on duty at the main gate of the temple. Thereafter, one of them forced his way into the temple complex. After entering the temple complex, he sprayed bullets from point blank range on a state police constable Dheeraj Kohli killing him on the spot and pumped bullets in shoe-keeper Lakshman Das, who also died of profuse bleeding on the spot. After this he ran towards the Dattatreya Temple within the complex and shot dead a woman pilgrim Ratna Sharma, who had come from Gwalior and was at the temple along with her seven-year-old son Gaurav. Gaurav survived the harrowing ordeal. After entering the temple the militant abused the priest Jeevanand who was chanting hymns while performing traditional puja rites. Shaken by the presence of an armed militant, the priest tried to escape when the ultra aimed his Kalashnikov at him. But when he discovered that he has exhausted his magazine, he triggered explosives tied to his belt and blew himself up. Talking to newsmen the IG, Mr Gupta said Head Constable Sarveshwar, constable Tagan Taki, constable Dhiraj Kohli lost their lives while fighting the ultras. 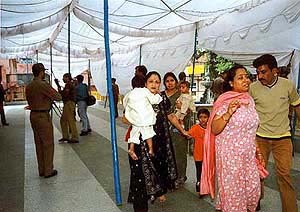 Among the civilians killed were Laxman Dass, Ms Ratna Sharma from Gwaliar, Shankar Singh from Udhampur. One civilian killed was yet unidentified. Two militants who had attacked the security picket outside the temple were also killed. Mr Gupta said that among the eight injured one Lekh Raj belonged to UP. Kuldip Singh, Rakesh Gupta, Praful Jain, Anjuin Binoo, Vinay Sharma, Vicky and Barun Gupta belonged to Jammu. He said that militants actually attacked the security picket and their aim was not the temple. He said only one militant sneaked into the temple and the other one was killed outside the temple. One car was damaged in the grenade attack. No militant outfit has claimed the responsibility for the attack. Soon after the incident large groups of people staged a demonstration in Raghunath Bazar and shouted anti-government slogans. They tried to take possession of the bodies of the militants whom they wanted to cremate on the road itself. The police intervened and resorted to a mild cane charge to disperse the unruly protesters. As tension mounted shopkeepers closed their shops and the passenger transport services in and around the temple remained suspended for about an hour. 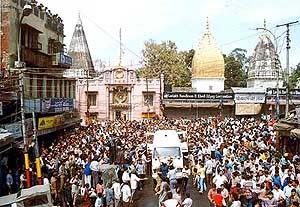 At the time of the incident there were atleast 60 pilgrims inside the temple who rushed out of the shrine on hearing the sound of the blast and firing. Chief Minister Farooq Adbullah is arriving here from Srinagar, official sources said adding he is likely to visit the temple and hold a meeting of senior police and civil officials.